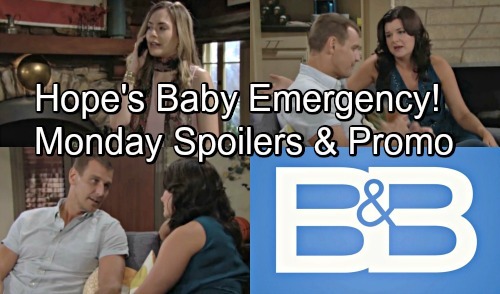 The Bold and the Beautiful (B&B) spoilers for Monday, September 3, tease that Hope (Annika Noelle) will start to panic. She just doubled over in pain, so she’ll naturally be concerned about her baby. Hope will decide she needs to call Liam (Scott Clifton) and fill him in immediately. With a shaky voice, Hope will admit that she’s spotting and needs to go to the doctor’s office. Of course, Liam will rush back to Hope right away. He’ll explain the situation to Steffy (Jacqueline MacInnes Wood), so she’ll understand why he has to dash off. Since this is an emergency, Liam will insist on taking Hope to the hospital. They need to get Hope checked out ASAP and see what might be wrong. The Bold and the Beautiful spoilers state that Liam and Hope will fear the worst. They’ll be terrified that they’re going to lose this little one. However, Hope will be focused on work drama the rest of this week, September 3- September 7. If she was going to have a miscarriage right now, she’d probably take some time off to grieve. That could mean that this is a false alarm, but Hope’s pregnancy will likely bring more complications eventually. Over with Katie (Heather Tom), she’ll share her frustration with Thorne (Ingo Rademacher). Katie’s fed up with Bill’s (Don Diamont) bad parenting, so she’s filing for sole custody. She’ll rant about how hard it’s been to see the pain in Will’s (Finnegan George) eyes. The kid feels rejected, so Katie thinks cutting Bill out is for the best. She can’t keep watching Bill break his son’s heart. Thorne will assure Katie that it’ll all work out. He’ll be certain that the judge will rule in Katie’s favor. Talk will turn to their relationship sooner or later. Thorne will want Katie to know that he’s all in on their new family unit. He’ll promise to be there for Katie and Will, so she’ll appreciate his consistent support. Katie will just hope that Will can settle down and have some peace in his life. Unfortunately, this custody battle will bring chaos for Katie. Her own life will be turned upside down if Bill has anything so say about it! B&B fans won’t want to miss the fierce scenes ahead. The Bold and the Beautiful spoilers hint that some twists are coming up in this case, so stay tuned. We’ll give you updates as other B&B news emerges. Stick with the CBS soap and don’t forget to check CDL often for the latest Bold and the Beautiful spoilers, updates, and news.